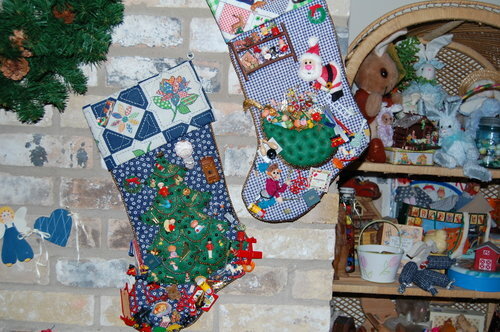 These are quilted stockings I made for my sons when they were small, starting with very plain decorations, but added onto them over the years according to their personal interests. When they got their first bikes I added a bike. Skis appeared the first year they took an interest in that sport. My peanut butter freak has a jar of PB on the shelf, and the Chinese Checkers addict has a CC board and marbles, etc. Other items on the stockings include: a Sears Catalog, a Monopoly game, Trivial Pursuit, sleds, bowling ball and pin, a can of tennis balls, walkman radios, a guitar, a drum set, baseball gloves and balls. Over the years I had to start sewing some things to the back of the stocking as the front got too crowded. They are really quite heavy and intricate - a treasure trove of memories. For the first time ever, this year my boys (now men) talked about how much fun it was each year - when I pulled out their stockings and added the trinkets I had found and motifs I had made during the year - to see what was new on their stocking. Some of the items are tarnished, and the stockings are somewhat soiled and worn from the "loving" they have received, but I wouldn't take anything for the memories they evoke.